Imagine surfing perfect waves with only a few guys out. You take off, find your line as the lip throws over your nose of your board. The emerald green water engulfs you as the roar of the tube washes out the noise from beyond. The compression of the barrel spits you out and you just got the wave of your life. Now imagine this could be you! Only in Indo... Photo sent by my friend Jpoko. Hope everyone is having a great week! The waves on the south shore went from flat to chest high these past few days which probably made some surfers happy. This guy looked a little bored all by himself with nothing to ride. It could be worse...with 50 degree water temperature. Got to surf with only two other guys in the line up which was fun! Winds are light for next few days but lots of work to do so gotta pound the pavement before my next trip. Busy week editing, filming with Merlinda Garma for another exciting episode of Hawaii Skin Diver TV. Before we use to film on location alot but when the sun is not shining or the elements are not cooperating then it becomes a long day. So we started using a green screen to film and now we have no limitations to when and where we can put Merlinda. Watch HSDTV on channel 12 or 1012 or online at www.oc16.tv whenever it airs on TV. Thank you all for watching and making HSDTV one of the most watched shows on OC16. My friend Travis Masutani been on fire in the blue water lately while fisherman around Hawaii have been longing to hook something for dinner even a small aku. He sent me some pics of his latest catches. This shark was not one of his catches but seems these men in grey suits have been getting in the news lately. 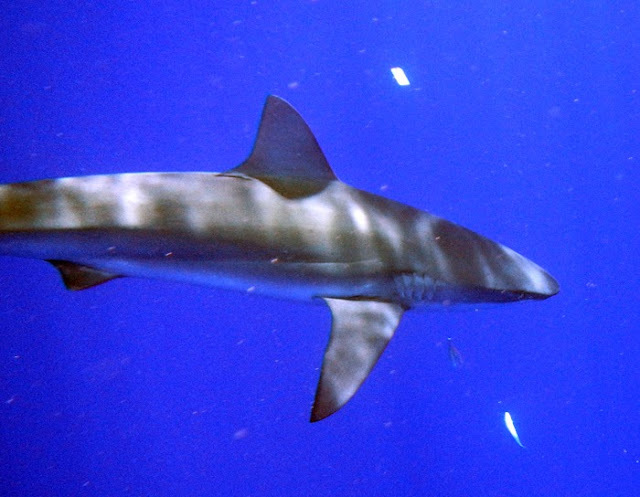 Almost every time we dive we see these guys and often if there are no sharks there are no fish. Travis and his dive partner Brad hauling it in. Good job boys! Family reunion appetizers this weekend was awesome! One of our relatives brought over this platter of sashimi and spicy poke that lasted for about 2 minutes with about 50 hungry people. Looks like some incentive to go fishing again soon. 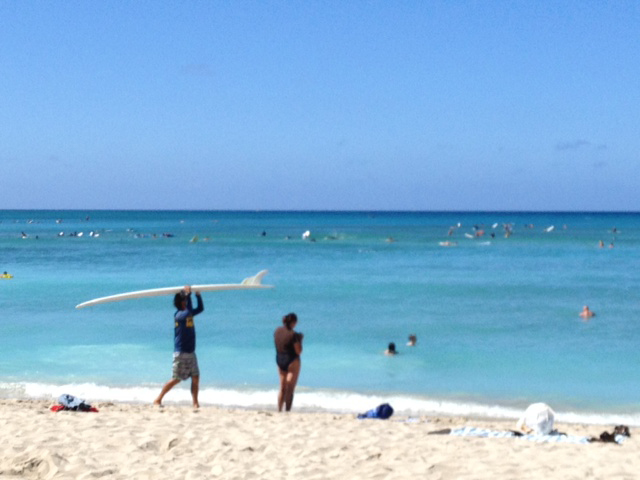 Small waves prevail in our hawaiian islands but still got lots of work to do this week. 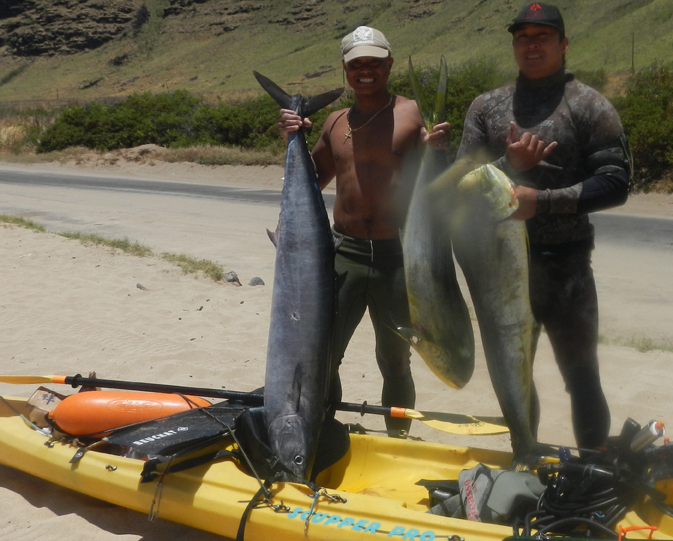 Next trip coming up is Niihau! Can't wait! This week I had the opportunity to meet the Governer of Taiwan! What an honor to be able to share some ideas with he and his team from the Tourism department to help promote surfing in Taiwan. I have a few friends who have been traveling here to surf and explore. 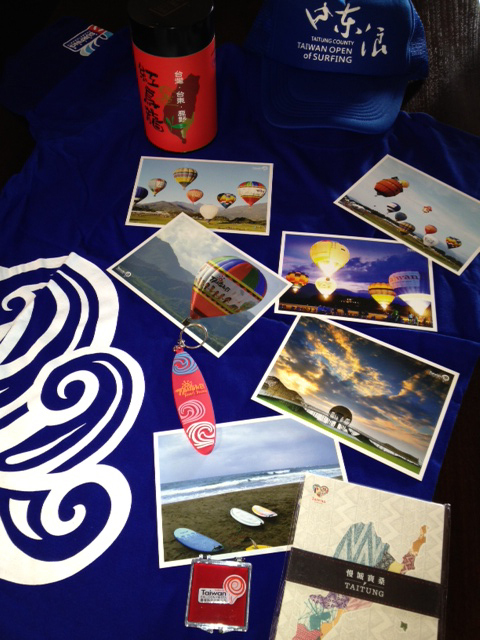 Besides surfing, hot air balloons is very popular and a unique cultural experience. Thank you Governor Huang, Mrs Chen, and Mrs Chang for the wonderful gifts from Taiwan! Where are the waves? That's the questions thousands of Hawaii surfers are asking. Been quite small past few weeks and not much going on. 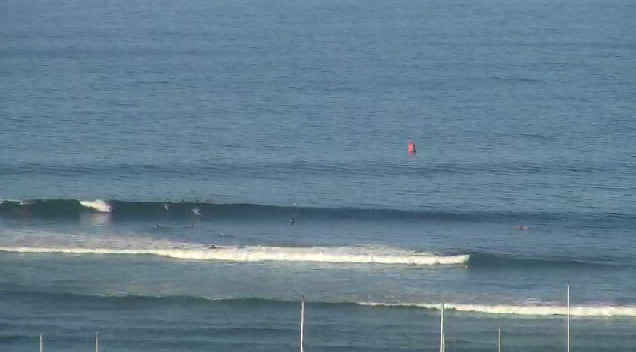 Maybe knee to chest high at the better spots. 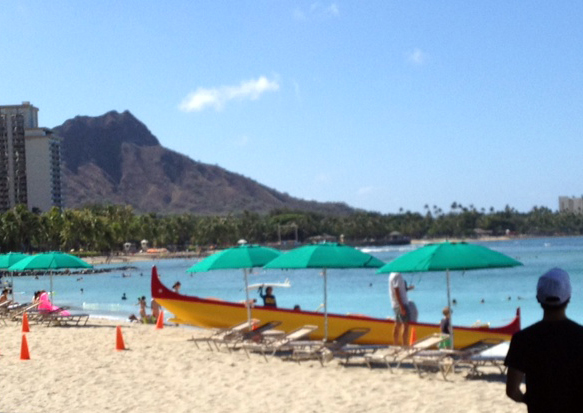 This is a view of Diamond head from Waikiki beach. I rarely see this view because of all the tourist and crowds in Waikiki I tend to avoid this area. 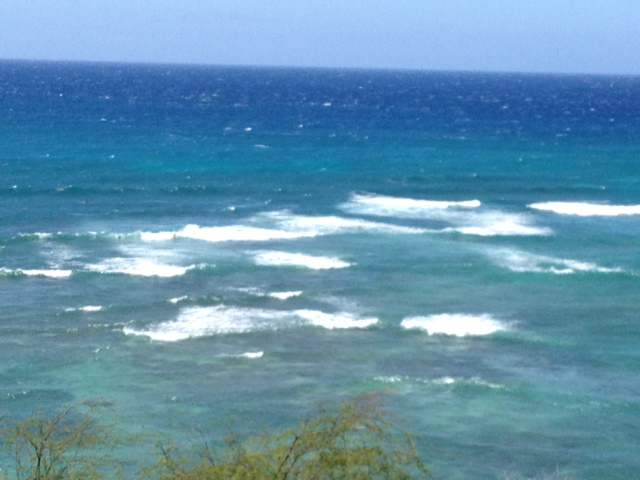 This is Diamond head surf break with side shore winds on it. It wasn't too inviting for me either so opted not to paddle out here. As the flat spell continues on the south shore, all I can think of is winter. I miss the north shore waves and big barrels. Just a few more months and hopefully we will get back to normal. Until then enjoy the beautiful Hawaiian weather and go fish or dive. 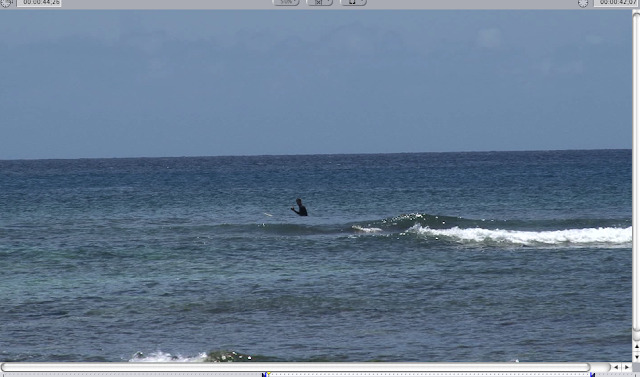 It was a busy week at work editing and setting up trips for 2014. Surf has been small, weather has been junk, but we still are lucky to live Hawaii. I was blessed to receive some new Gaji lures, called "Aku rockets". 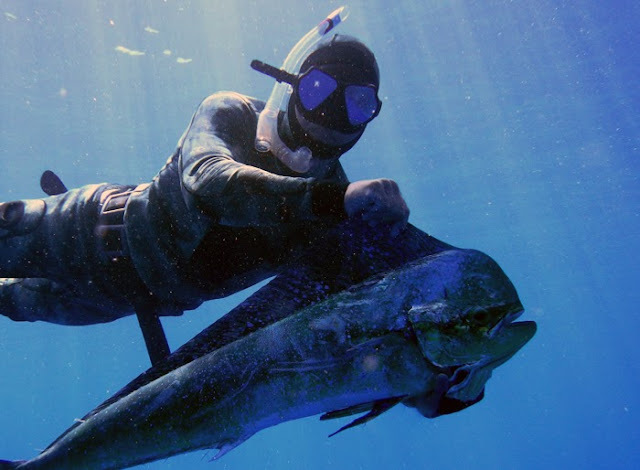 Ahi season has slowed down, but Akus are running so time to shift gears! 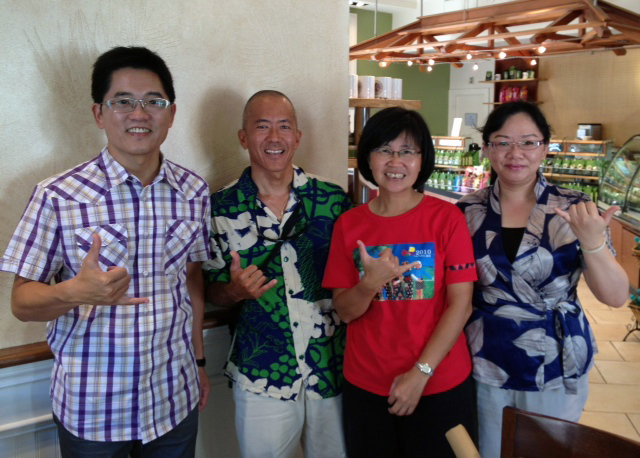 Mahalo Allan Sato for always supporting us! Don't miss out on all the action, choose Gaji lures! This is where all the magic happens behind the scenes of OC16. People don't realize how much work it takes to put a show on air but there are a lot of hands who make it all work. Mahalos Laa, Graham, Jed and the crew for always supporting Hawaii Skin Diver TV! My friend Michael Uyehara and his son Eric put this youtube video together of our recent Mexican Shootout. He caught this rooster fish which was perfect size to print on our tshirt so we pulled out the paint and went to work. Everyone had a blast and after 3 hours of printing we had many more gyotaku artist in the house. A great way to capture the memories! Thanks Mike/Eric for sharing the video. See you next year! Was flipping through some surf shots and found a couple nice pictures of these Hawaiian Surfer Girls. This was Cecile Kim's first surf trip and definitely not her last. Her surfing level went up 10x after surfing this spot. She was super nervous before the trip and after her confidence went up big time. This wave had her name written all over it and she was in the perfect spot. Lena Ching aka "da charger" also pulled into some big waves. Lena travels with us often and always gets the best waves. She works as a real estate agent at Prudential so call her if you need to buy or sell a home. Good job girls! Keep on ripping and see you at the peak!